Well folks, I’ve done it again. This is a long one, so pull up a chair. Pour yourself an adult beverage if you like. Me, I’d rather have some green beans with a good story. Suit yourself. OK. Here I am doing a big stretch on the back patio a while ago. 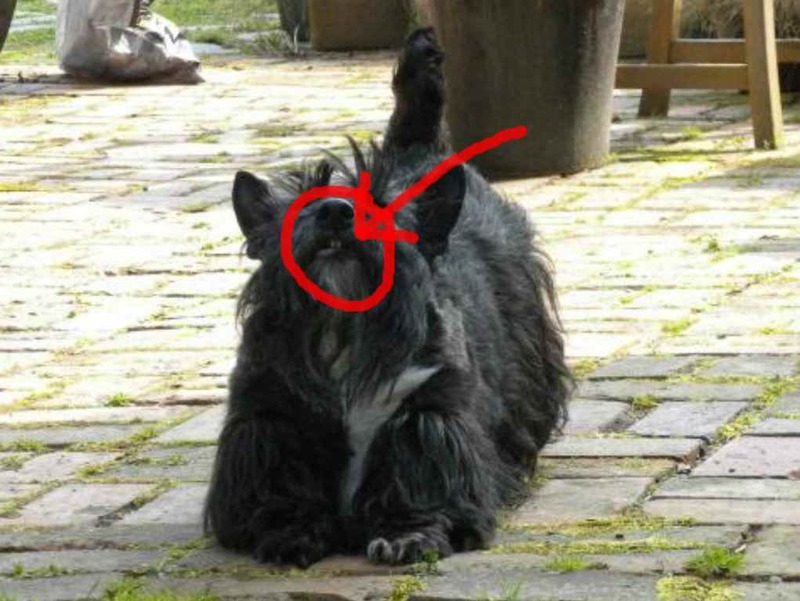 Notice the snaggletooth circled in red. You may not be able to notice it all that much, but a few years ago I lost a bottom tooth due to some, let’s just say, fence aggression. Seems I was having a bit too much fun biting the chain link fence between me and one of my neighbors. Ta dum. I was mad. What can I say? So, the tooth had be pulled. It was hanging on by a thread anyway. Darn that fence. Well, I’ve done it again. Hurt myself. Not my teeth, though. My toe. And there’s no picture to show you. And that’s a good thing. It was ugly. See that stuff between the bricks? It’s called pointing. And some of it was missing at the bottom of the steps and one of my toenails got caught in the hole and, well, the top of my toenail just ripped off as I was climbing the stairs! OUCH. YES. IT. HURT. A. LOT. So, the peeps did what good peeps do. They checked my foot. They checked the pads of my foot. Between the pads of my foot. The bones leading to the toenails. Nothing. And I just climbed the stairs as pretty as you please. So, They decided it was OK to take me to the Urbanna Oyster Festival that day anyway. And They dragged me around the whole afternoon. Sometimes, She picked me up and carried me when I favored my foot. So, They checked my foot again. Not until the NEXT DAY did They discover, thanks to my Godmother Carol, THE NAIL HAD RIPPED OFF! Don’t you know the peep was hysterical. “How could we treat our baby that way when he was in pain? How? How? OH! My poor baby! Made him walk all day!!! !” Sobs. Sobs and more sobs. Yeah, I milked that for a LOT of attention. But, it really did hurt. So, the moral of the story is this: if your foot ever gets hurt and your toenail splits, be sure to CLIP THE HAIR AWAY FROM THE NAIL. Yes. That, helps the peeps see what’s going on. (Duh. They’re not too bright.) Then, soak the toe in warm water and epsom salts, then, once it’s dry, paint the nail with super glue, otherwise known as cyanoacrylate. It’ll seal the wound and help it heal. They even use this stuff in surgery! Seems everybody knows about super glue!!!! Who knew?????? My Godmother Carol, that’s who knew. Now you know, too. 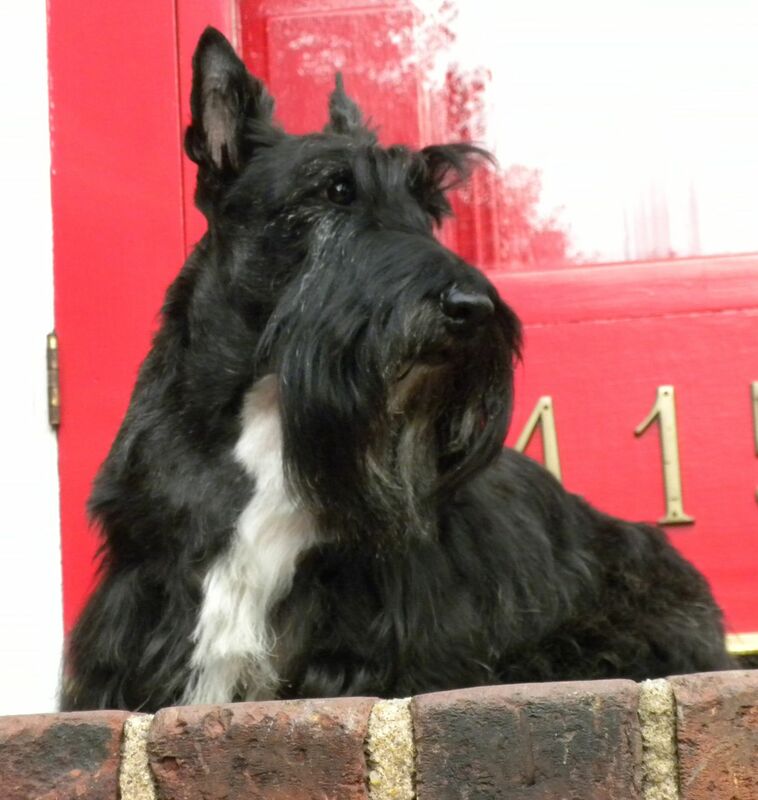 This entry was posted in The Scottie Chronicles and tagged dog first aid, dog health, dogs, Scotties, super glue. Bookmark the permalink. Oh my…. you poor fellow… we know that hurts like heck…and scotts are so stoic we hide our ‘owies’ most of the time….. our ‘before us’ scottie tore a nail out on a metal door’mat’. Oh, how our mama cried for her little gal…and yes…served lots of ‘tea & sympathy’ to the little miss. Wish (really do) we had an Auntie Carol ~~~~~ she is the best !!!! Poor Stuart. We scotties are very stoic. We hope you’re toe is better soon. Super glue is great. Sometimes SHE puts it on HER thumbs when they split in cold weather. What a boyfriend! You tried to be like me and have a toe amputated. As I’ve said….ANYTHING for you…. oh Stu! That sounds terrible – your poor peeps must have been beside themselves give the agony you were in! Say, did you get any oysters? Mum uses super glue all the time on her paper cuts and split cuticles – brilliant stuff, it is! Holly Molie! You had some weekend! We are glad it wasn’t an amputation type of thingy. Milk it all week, you deserve extra green beans! Wow! You are soooooo smart! I had no idea you could fix a toe nail with super glue. Does that mean you have special super powers now? You are one cool dude. Whew, that had to be mighty painful buddy, so glad SOMEBODY (Carol ) came along to get you fixed up. Ouch! Hope your toe feels better soon! Oh your poor chap!!! I hope it gets better really, really quickly! 😦 . Hugs from Aunt Sharon. I’m afraid I’m not jumping off my sofa to get in the big bed anymore. Sigh. Shelby sympathizes with you. She ripped her dew claw at a funny angle while walking. It had to be seen by the vet. She milked it for all it was worth too. Ouch! That had to be soooo painful! You poor guy. It’s a good thing you told us about how to treat torn off nails. That’s a very good PSA. I try to be helpful. Even if it hurts. Man Stuart you are really brave because we all know how much that hurts! Hope you get to feeling better soon my friend. Sending you some healing purrs. I’m feeling the purrrrs buddy. Thanks! That sounds like a BAD ouchie Stu. I hope it doesn’t hurt still……will the nail grow back or will you be nail-less????? I’m hoping it’ll grow back like normal. Oh boy. If not, I’d be one less tooth and one less toe. Poor Stuart! Gosh, did you cry a lot when it happened to you on the step? My adopted Sis’ , Tessie, the Cairn/Westie mix, has a broken tooth too, because she chewed EVERYTHING when she was a puppy! The Vet said that she might have to get it removed when she is older! I hope you get all better soon, Stu! Take care of your doggie self!